I’ve been giving talks at game industry events since 2014, and teaching on university games programmes since 2013. If you’d like me to bring my expertise to your event or university, please get in touch! I’m capable, enthusiastic and experienced at leading workshops, presenting talks, and running full semesters of classes. At DIT, I lectured on Interactive Narrative (3 years), RPGs & LARPs (3 years), and Project Management (1 year) on the BA in Game Design. At Trinity College Dublin, I lectured on Interactive Narrative on the MSc in Interactive Digital Media (2 years). I gave a 1-hour talk at Creative Coast titled “Writing Through The Storm: How To Keep On Writing When The Going Is Tough.” The focus was on maintaining creativity through crunch. I gave a quick-hit talk at Screenshake 2017 titled “Don’t Hit The Snooze Button: How To Become A Better Writer In 10 Minutes Per Day.” I gave a 7-day programme to improve skills. I’ve taught Interactive Fiction (from paper, to Twine, to Unity) to hundreds of students at many locations, including: Irish Writers Centre, ITU Copenhagen, ReFIG, State of Play, V&A Museum, Level One Jam, Dublin Twine Jam & many more. I gave a 30-minute lecture at Nordic Game Jam titled “Theme Player: Finding Writing Inspiration When The Clock Is Ticking.” The focus was inspiring game jam narrative creativity. I gave a hypertalk at AMAZE titled “Surrender” on meditation and awareness for creativity. Getting 400+ people to meditate together made me happy. 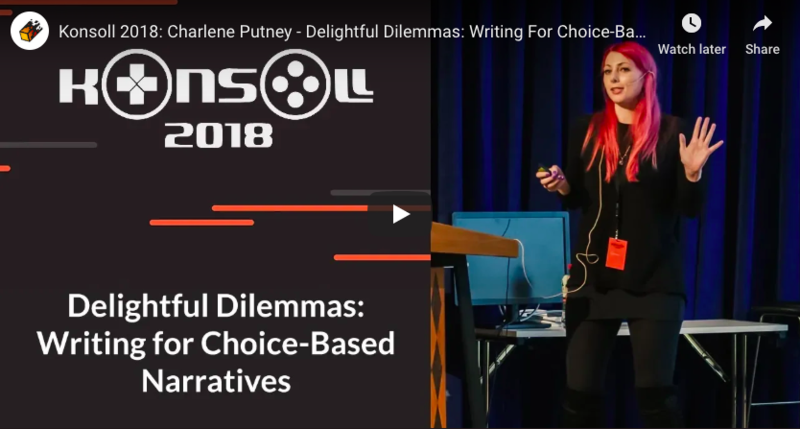 I gave a 1-hour talk at Konsoll titled “Delightful Dilemmas: Writing For Choice-Based Narratives.” The focus was on inspiring creativity and crafting compelling choices in narrative-based games. If you’d like, you can watch it here. I gave a 30-minute talk at Game City titled “New Play Aeon: An Exploration Of Playful Occulture” which looked at occult techniques for game creation and finished with some joyful group yoga. I gave a 30-minute talk at Playful Arts Festival titled “Arcane Play: Playful Occulture In The New Aeon” which focused on applying playful techniques from magick to games.